So far, I’ve been able to track down most of these books through frugal means. Most of them I’ve gotten through the library. One (Fortunately) was through InterLibrary Loan (fancy!). 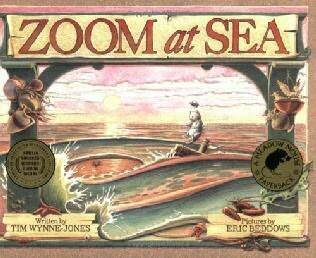 But Zoom at Sea was nowhere to be found, so I bought a used copy off eBay. Total cost of this series so far: $4. A version of this post appeared on Zwolanerd.com. I used to love the cartoon of this series and so I recognized the story here. 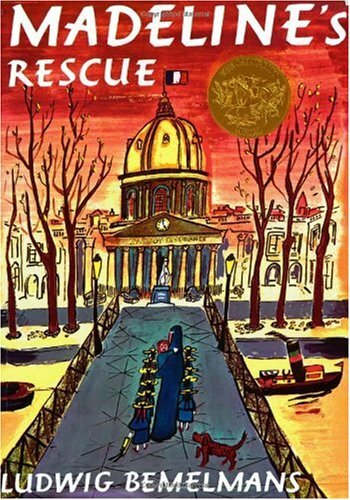 It’s the one about the dog that saves Madeline from drowning, and the girls decide to keep her. Peanut didn’t enjoy this book, although I can’t figure out why. It has rhymes, and dogs, but she only wanted to read it once and then she was done with it. Too bad, I liked it. In case you wanted to see that cartoon for yourself, here it is! This was the second Madeline book, out of 7 total, one of which was only published in 1999, almost 40 years after the previous Madelines (and posthumously). The author reportedly emigrated to the USA after shooting someone, so that’s new for this list. I can barely count this book as having been read, because it was supposed to be delivered 3 weeks ago and either the mail delivery person left it at the wrong house or somehow it got lost while being carried inside, because I haven’t laid hands on it although it shows as delivered. (Good thing it was a free Paperback Swap trade.) So, we watched a YouTube video of someone reading the book. Twice. 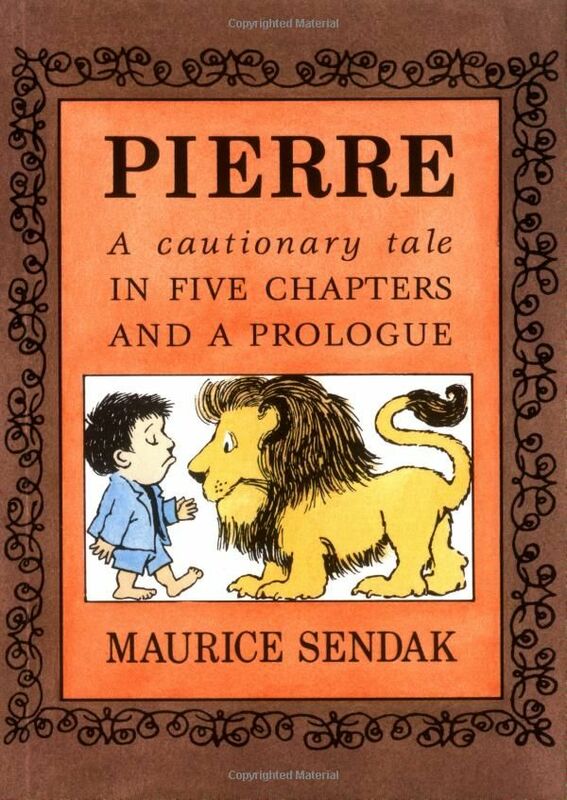 Pierre doesn’t care, and he says I don’t care so much that he happens upon a lion while his parents leave him at home alone, and he is eaten. Luckily, they cart the lion to the hospital and hold him upside down and out falls Pierre, who is now reformed and cares very much. Peanut liked it, she wanted to watch the video a couple of times. I think it would be okay to read out loud, although I didn’t care for the reading on the video. This book was part of a larger collection, called the Nutshell Library. It also spawned a song sung by Carole King, which you can also find on YouTube. 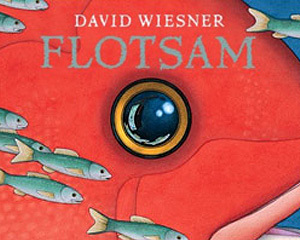 This book tells the story of a cat that loves to float on the water. It would be incorrect to say this cat loves the water, because he doesn’t really touch it. He likes to float around in the bathtub, and is overjoyed to discover his Uncle Roy has a connection to the sea. He shows up at an address and the woman inside, Maria, magically turns the interior of her house into the sea. I had this book (and another Zoom volume) as a kid. I had difficulty tracking it down, and it wasn’t until I realized it was a Canadian book that it clicked. I ended up ordering an old library copy from eBay, since the copy I had is long gone. Peanut sort of liked it. While researching this book I located a puppet production of the book AND the SLJ blog about this very list! At first, I thought this was going to be lame because it has no words and only pictures. But as we went along, it was pretty neat. The “story,” as it is, essentially shows a little boy finding an underwater camera with picture of a picture of a picture etc, several layers down. The boy takes his own picture, then chucks the camera back into the sea. The illustrations get the point across very well, and words probably would have been contrived and convoluted. This makes the first book that appears to have a dedicated website, but it hasn’t been updated since 2006. Apparently there was a contest for finding actual flotsam or something, which was the purpose of the website. It’s also the first book that contains a story despite having no words – the very essence of a “picture book”. This book is kind of a stream of consciousness about a 6 year old girl living in the Plaza Hotel in New York City. It’s written in the manic breathless way that 6 year olds sometimes talk. She also repeats certain phrases like “and charge it please thank you very much,” and “for Lord’s sake,” that is obvious she has overheard adults say. I’m aware that this book is very famous and beloved, but I don’t see the appeal at all. It is really long, at 62 pages, for a children’s picture book. Peanut got bored about halfway through. I ended up skipping pages to get to the end. It’s not easy to read aloud either, as there is no punctuation. I often felt out of breath while reading. As with Flotsam, this book also has a dedicated website, but it is more in the fanpage vein than official, as the author has passed away. 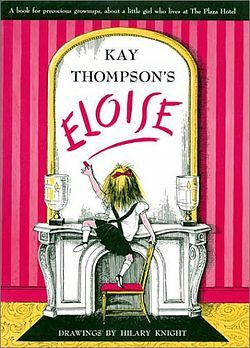 Eloise was apparently inspired by Liza Minelli, since she is the author’s goddaughter. It also began its life as a book for adults, and was revised into a children’s book, and underwent many edits over the years. I thought I recognized the name of the author, and it turns out it is the same Kay Thompson as in that version of Jingle Bells made popular by Andy Williams. The next batch won’t be late as we have already read and enjoyed most of them! The moral of THIS story is that Pierre is hard to find. My guess is that the blunt “would you like to die” from the lion is too much for most parents. Review: Are You There God? It’s Me, Margaret.